The human body is 18 percent carbon, which means that if you subject it to high enough pressures at high enough temperatures and hold it there for a long enough time, it will form diamonds. You can try this yourself, in a laboratory. All it takes is, say, a pound of human ash, more than 4,000 degrees Fahrenheit, and 60,000 times the standard atmospheric pressure of Earth at sea level. Extract carbon, bake, compress. Check back in a few weeks. Not a DIYer? No problem. Just FedEx your burial urn to one of the many Internet-facing memorial-diamond companies that have sprung up in the last few years. For between $2,500 and $25,000, outfits like Chicago’s LifeGem and Switzerland’s Algordanza will take the cremated remains of your loved ones and return them, presto chango, in the form of wearable jewelry. Diamonds created from human ashes often carry a blue tint. This is because of the boron contained in bone. “I don’t know why,” the CEO of Algordanza has said, “but if the diamond is blue, and the deceased also had blue eyes, I hear almost every time that the diamond had the same color as the eyes of the deceased.” Gems can also be synthesized from dead pets and, since the mid-2000s, from hair. Several memorial-diamond firms report revenue in the millions of dollars. In 2007, a diamond made from a lock of Beethoven’s hair sold on eBay for $202,700. The World Cup tends to gather every thread of weirdness on the planet; as the largest human spectacle in existence, it rolls through every four years trailed by a vast peripheral freak show of psychic octopuses, celebrity witch doctors, and horse-placenta fetishists (otherwise known as soccer players). So it’s no real surprise that the tournament’s 2014 edition is now officially the World Cup of diamonds made out of people. In late May, a Brazil-based memorial-diamond company called Brilho Infinito began selling a series of 1,283 diamonds made from the hair of Pelé, the most celebrated footballer in Brazil’s football-obsessed history, and widely regarded as the greatest soccer player of all time. The 1,283 gemstones are one for every goal that’s claimed on Pelé’s (dubious) official record. The gemstones are selling for about $7,500 each. The proceeds will be donated to a pediatric complex in Brazil. To be transformed into synthetic diamonds: Could you have scripted a more fitting apotheosis for Pelé? Since his retirement in 1977, the 73-year-old legend has occupied the uneasy territory between living god and soulless corporate shill. Celebrated to the point of numbness for his genius on the pitch, he’s been mocked as a sort of ambulatory MasterCard scanner off it, a kept superstar willing to slap his name on anything for a bag of cash and a pat on the cheek. Creation myths often include a moment when the god dissolves and becomes the universe, like the Chinese deity Pangu, whose beard became the stars; it seems right that when the same thing happened to Pelé, he sparkled forth into a marketing gimmick for a company that specializes in forging sentimental finger bling from your departed Labradoodle. Pelé is, of course, a key face at this Brazilian World Cup, its solemn cornpone patriarch. He’s stirred anger in Brazil, during the tense and sometimes violent season leading up to the event, for criticizing protests against Brazil’s runaway economic inequality — if it’s all the same to you guys, he’d very much prefer that the marches not threaten the smooth tinkling of the FIFA cash register, thanks.1 It’s the same old story: brilliant soccer player in his day, now totally out of touch. They’re making diamonds out of his hair and he can’t quite see that crushing poverty might be more important than sports. (He denies, in fact, that political corruption and soccer have any bearing on each other, which, OK, but don’t sail over the edge of the flat Earth on the way to confront your denial.) It’s more than just another case of an athlete who won’t risk an endorsement by speaking out against politics. It’s a blindness. Pelé first took the global stage as a slender 17-year-old in the 1958 World Cup, in which he featured as a golazo-scoring wonder child, not yet a god but clearly touched by one. He’s been a living symbol of Brazilian soccer ever since; even now, in his current state of jeweled bedazzlement, there are these odd little links. For instance, the headlines. “Pressure ‘huge’ on Brazil World Cup team.” “World Cup 2014 heat is now on Brazil to perform.” Crushing pressure, searing heat: You half expect the Brazil squad to turn into diamonds themselves, before Group A even kicks off. The last time the country hosted the tournament, in 1950, the heavily favored national team imploded in the final against Uruguay, losing 2-1. Days of planned celebrations went crashing to a halt, unthrown confetti trickling out between numbed fingers. Now, favored once again, Phil Scolari’s team is expected to redeem this historic disaster. The Seleção haven’t lost a competitive home game in more than 39 years. They have arguably the most talented team in the tournament, with a squad led by the slippery and startling 22-year-old forward Neymar and anchored by a powerful defense. They’re young, but at their best they’re lethal. In the Confederations Cup final last June, they rolled an era-defining Spain team 3-0, borrowing counterattacking, gegenpressing tactics from Bayern Munich to shatter the flow of Spain’s Barcelona-ish tiki-taka. Outside Brazil, they’re the trendy pick to win the tournament. Inside, anything less than a win on the last day in Rio might as well be a hunk of ash. When Brazil started winning World Cups, beginning in the late 1950s, the country’s rise seemed like the spontaneous flowering of a true national tradition. The dizzying, dance-like style of Brazil’s soccer seemed like such a natural expression of Brazilian culture, almost an art form. Samba rhythms. Yellow shirts. Little kids dribbling barefoot through the favelas. The imagery seems clichéd now, but still: In its original form, it’s still powerful. Like its most famous player, Brazil arrived as a kind of sunburst of folk-football. It was like nothing else the world had ever seen. Like Pelé, though, Brazil spent the next several decades devolving into a capitalist simulacrum of itself. Start poking around in the corruption charges surrounding the Brazilian Football Confederation and you enter a world that is byzantine and maddening and hilarious, a world populated by some of the highest-profile figures in soccer. In the 1970s, (Brazilian) FIFA president João Havelange, who served from 1974 until 1998, both pioneered the current system of corporate sports sponsorship and refined world soccer’s commitment to collusion and bribery. He used to send the Brazil team around to play friendlies in countries whose support he wanted to buy, like a gift basket that could do bicycle kicks. By 2001, when the Brazilian Football Confederation was the target of a congressional investigation — Ronaldo was called in to testify; the questioners wanted to know why the Seleção hadn’t been able to mark Zinedine Zidane in the ’98 World Cup — Nike had essentially bought the right to schedule the team’s matches. Joga bonito was welded to a permanent TM superscript. That blue is the color of my dead grandmother’s eyes. Lately I’ve found myself thinking about Garrincha, Brazil’s other greatest soccer player, whose life was a kind of dark mirror image of Pelé’s. Do you know about him? Maybe you saw the 30 for 30 documentary, The Myth of Garrincha, that aired about the same time as Brilho Infinito announced its line of Pelé hair-jewels. Just an amazing player. So was Pelé, of course, but because Garrincha has been semi-forgotten outside Brazil there’s something more poignant about his legacy. Brazil never lost a match when he and Pelé played together, and he won two World Cups, and he was the unquestioned star of the 1962 tournament in Chile, but his on-paper accomplishments don’t really explain why some people love him in a way that’s unique among soccer players. Pelé was the numbers superstar, the player who scored more goals and won more trophies than anybody else. Pelé was a winner. Garrincha was a loser who just happened to have this astounding gift. He was born with deformed legs; doctors didn’t know whether he’d ever walk properly. He became probably the greatest dribbler in soccer history. They used to call him Anjo das Pernas Tortas, the angel with crooked legs. His personal life was a wreck; he drank like he was bent on suicide, wrapped cars around stationary objects, fathered more than a dozen children. But he played with such joy. They called him that, too: the joy of the people. He would beat his defender on the wing, then dribble the ball back for the fun of beating him again. “People almost died laughing,” Eduardo Galeano wrote. 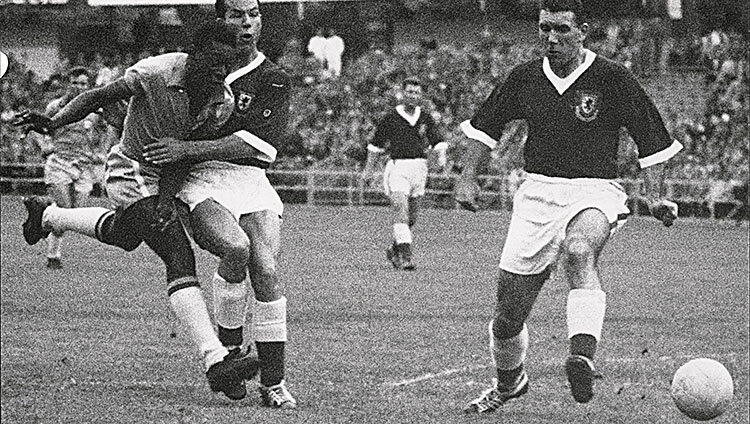 It’s an easy trope, contrasting Pelé and Garrincha, but for a good reason. While Pelé and the Brazilian Football Confederation were corporatizing themselves throughout the 1970s, Garrincha was drinking himself to death in Rio. Pelé has literally been turned into diamonds; Garrincha died in an alcoholic coma nine months before his 50th birthday. He is Brazilian soccer’s lost might-have-been, the emblem of an approach to the game that couldn’t survive Havelange and FIFA and politics and the need to win and win at all costs. I don’t know whether soccer has any power to redeem the damage that it abets and causes. If it does, then I don’t think it’s through whatever happens when your team wins the World Cup; I think it’s through the kind of gratuitous joy that Garrincha used to inspire. Not the sense that you are witnessing something triumphant, but the sense that you are sharing something delightful. The sense, however long it lasts, that you are united in something good. The changing rooms at the Maracanã, Brazil’s national stadium, are named after Garrincha and Pelé. To me, the single most hopeful thing about Brazilian soccer is that Pelé’s is the visitors changing room. There’s still something in the tradition that wants to be close to Garrincha. Still something that wants to make you die laughing from sheer mischievous delight. 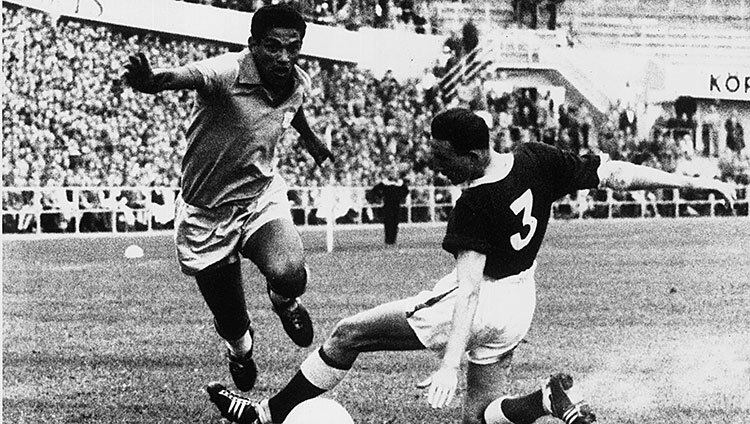 There is no possibility that this World Cup will cast itself in Garrincha’s image more than Pelé’s. But if his spirit could just touch it a little. If the next month could just remind us that FIFA’s agenda is not all that soccer can be. Wouldn’t that be a more magical transformation than anything wrought upon Pelé? A lab can turn your hair into diamonds, but real wonder goes deeper. Those are pearls that were his eyes. Brian Phillips is a staff writer for Grantland.